Early in the pre-production stages, it looked like Robert Aldrich would direct with Lee Marvin in the lead role, until Marvin’s clash with Warner Brothers led to Robert Mitchum taking the role. To the director’s unwelcome surprise, Mitchum did not want to work with Aldrich, so Sydney Pollack was brought in to replace him. Pollack’s attachment meant interest from Robert Redford—who had already worked with Pollack in Jeremiah Johnson and The Way We Were—in the lead role, though Redford deemed himself too young and Mitchum remained. After they’ve been condemned to death by the yakuza and already lost two people close to them, Harry and Ken team up for a revenge assault, first against Harry’s old friend George Tanner (Brian Keith) and finally against the yakuza boss Tono (Eiji Okada). Harry dresses for the assault in a tan parka, hip-length and fur-lined through the body and hood. The parka has a covered front fly that buttons left-over-right with additional buttonholes on the right side that ostensibly connect to buttons along the inside of the left. The parka is pulled in at the elasticized waist, where it has a belt stitched into place on the sides with two loops on the back. The belt is meant to close in the front with a single-prong buckle, though Harry wears it open and occasionally tucks at least one end of the belt into the pocket. There are two bellows pockets on the hips, each closing with a button-down flap. The sleeves have tan leather trim on the edges and can be tightened with a half-belted buckle on the inside of each cuff. Note the details of the parka: adjustable half-belt under the cuff, bellows pocket with button, removable fur lining, and the adjacent button and buttonhole on the right side. The parka’s removable fur lining is the same shade of tan as the shell, buttoned into place and insulating the torso area of the parka as well as the hood. There are three buttons along the edge of the hood. Ken and Harry face one final adversary. 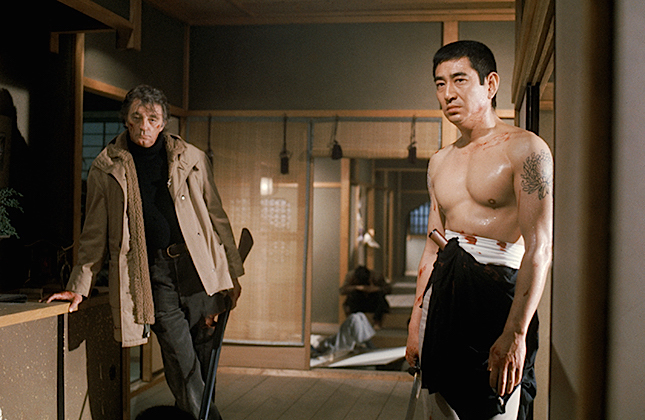 The Yakuza is one of the best movies for fans of the turtleneck, as both Robert Mitchum and Ken Takakura cycle through plenty of rollnecks worn with suits, sport jackets, and casual wear. For this revenge mission, Harry wears a heavy ribbed-knit turtleneck in black wool, perhaps too bulky to qualify as one of Sterling Archer’s beloved “tactile-necks” but employed more or less for the same purpose here. Harry tucks the turtleneck into a pair of taupe brown corduroy trousers with frogmouth front pockets and flared plain-hemmed bottoms. Production photo of Robert Mitchum and Ken Takakura. The trousers are worn with a dark brown leather belt with a large single-prong buckle, rounded on one side and in a polished gold-toned metal. The belt coordinates with his brown ankle boots. Harry metes out revenge with his .45. Mitchum wore his own Rolex through much of his ’70s oeuvre, though his stainless Rolex DateJust with its silver dial and steel “Jubilee” bracelet can only briefly be glimpsed under his left sleeve. The perfect choice for a former U.S. serviceman, Harry Kilmer arms himself with a .45-caliber M1911A1 pistol with a scratched-off serial number from his friend Oliver’s collection, using it to great effect throughout The Yakuza. During this era, the .45 ACP blank round was unreliable so many productions—The Wild Bunch, The Getaway, and Three Days of the Condor to name a few—replaced .45-caliber 1911 pistols with cosmetically similar Star Model B pistols that fired the more universal and blank-reliable 9×19 mm Parabellum round. 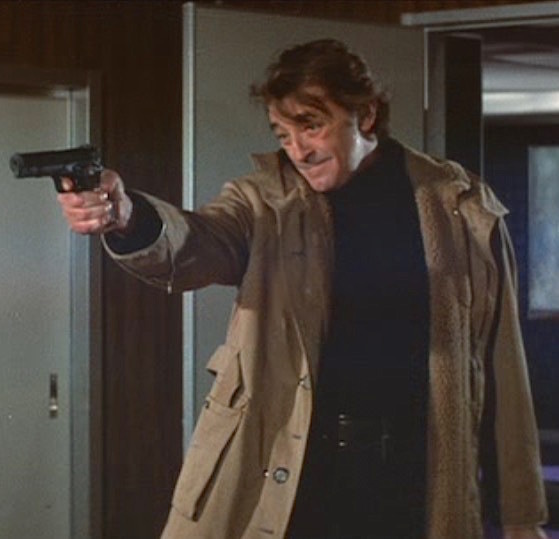 The Yakuza appears to be an exception as Mitchum seems to be fielding and firing a genuine M1911A1 throughout the movie. Note the large muzzle bore, indicating that Harry is likely armed with a genuine blank-firing .45 than a 9mm substitute. Harry also uses the snub-nosed .38 Special revolver that Ollie had given to Dusty (Richard Jordan), which appears to be an early model Smith & Wesson Model 10 with a 2″ barrel. Two-gun Harry crashes into Tanner’s office. Harry’s heavy artillery is a hammerless boxlock double-barreled shotgun, lent to him by Goro. Not only does Harry field this massive weapon with just one hand, but it’s his non-dominant left hand and it’s while alternating his use of a heavy .45 or .38 in his right hand. Harry upgrades his backup weapon into something a bit heavier. 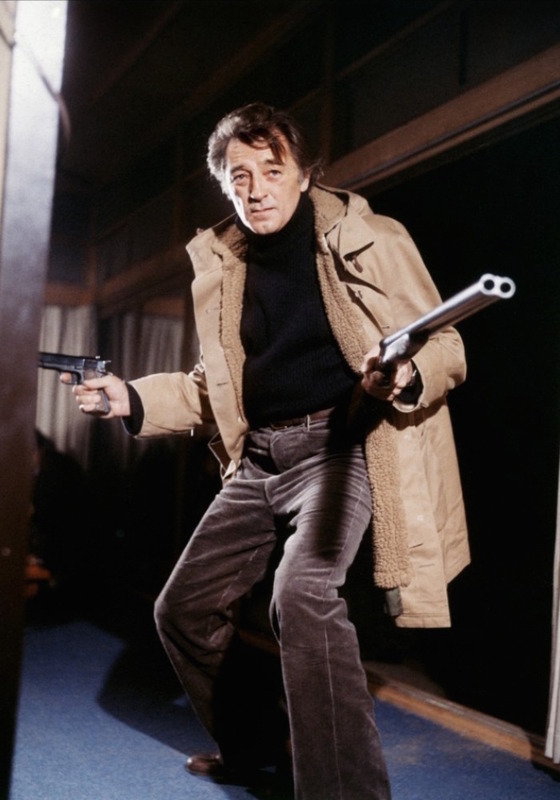 Robert Mitchum dresses for action and comfort when taking on a dangerous yakuza faction, though his style could just as easily be channeled for a walk outside on a chilly spring weekend. Well, it may be futile, but it’s not a gesture.